Using the More Realistic Survival addon for Minecraft Bedrock (PE), some elements of the gameplay will become indispensable and you will seem that this should be in the original game. 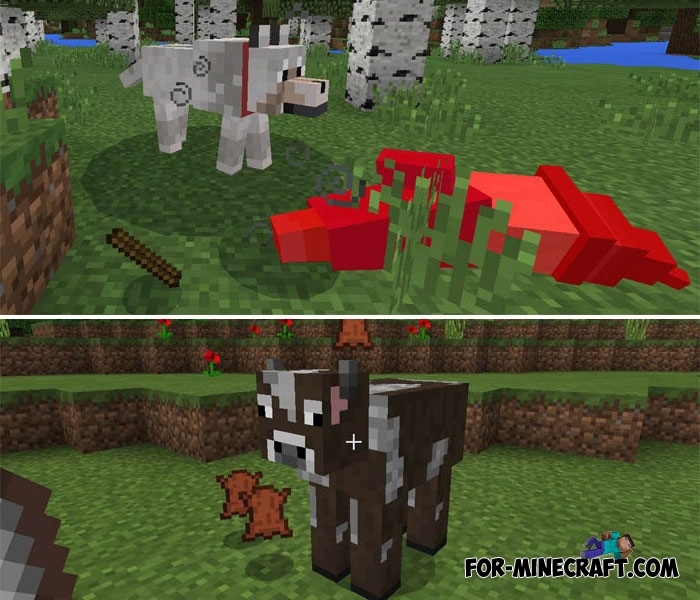 The addon only affects wolves and cows and these features are much easier than you think. 1. Now wolves can be used as horses. It's hardly you will find a companion better and more enduring than a horse, but the addon adds an excellent ability to wolves. Your four legged friends can not only protect the owner from enemies, but also be used as a means of transportation. 2. Leather is the basis for armor and other things and can not be replaced by anything else in the case of crafting this particular armor. To receive, you will need to hunt for a long time, but not all players want to do this, so installing this addon shears can be used for getting leather. How to install the More Realistic Survival addon? There is no way that riding wolf and cutting leather with shear are realistic. Just looking for better mod.